If you're a workaholic, who'd rather conduct business than any other activity, you'll understand the border collie's mind. These intense, intelligent dogs come in smooth- and rough-coated varieties. Unlike other purebreds, where appearance is paramount, border collie breeders concentrate on -- you guessed it -- the dog's ability to work. Originally from the border country between England and Scotland, this dog's purpose was to aid farmers as a canine shepherd, working long hours in difficult terrain. Farmers crossed the traditional collie with racing hounds and setters, creating a swift, agile creature whose eyes never left the sheep they herded. Today, the border collie's intense, focused gaze, "the eye," is one of the most distinguishing characteristics in the working dog. Border collies range between 18 to 22 inches tall at the shoulder, weighing between 25 and 55 pounds. Males grow larger than females. 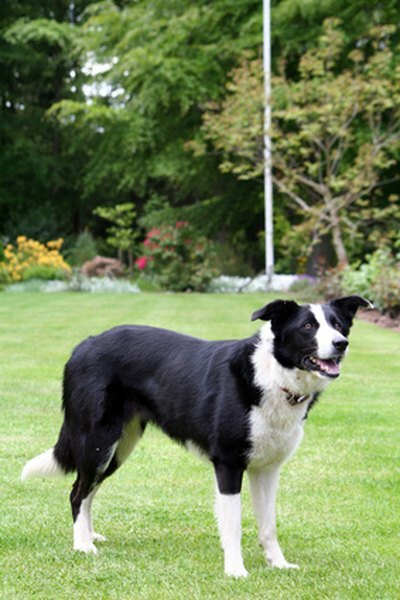 Both the rough- and smooth-coated border collies have a top coat and undercoat, dense and resistant to the elements. The American Kennel Club notes that the smooth-coated variety has shorter hair over the entire body, apart from some feathering on the legs, chest, ruff and haunches. Because the emphasis is on performance, any color, mix of shades and amount of white is permissible. The temperament of many modern purebred canines bears little resemblance to the work the breed was originally meant to do. This is emphatically not true of the border collie. He's an exceptionally smart dog, but you must give him a job. Without one, he'll become miserable and destructive. He's high energy, needing lots of exercise and room to run. He prefers his own human family to strangers. Some border collies are shy, some outgoing, but all get serious when it comes to work. If you don't give him the time and guidance he deserves, he'll find an outlet for his energy -- maybe remodeling your living room, if you get the drift. At this point, you know the border collie requires training. If you're up to it, training this breed results in an uncommon bond between master and dog. If you're not familiar with border collies but have general dog experience, you might be amazed at how smart a dog can be. Your border collie can't wait to soak up training and obey you, as long as you keep him active. Maybe sheep herding isn't your thing, but substitute agility, flyball or other doggie competitions, and he'll shine. Exceptionally free of genetic diseases for a purebred dog, the primary hereditary problem found in border collies is hip dysplasia. This malformation of the hip joint, common in many breeds, leads to early arthritis and lameness. Deafness and eye issues also appear in the breed. Do Short-Haired Border Collies Grow Hair?